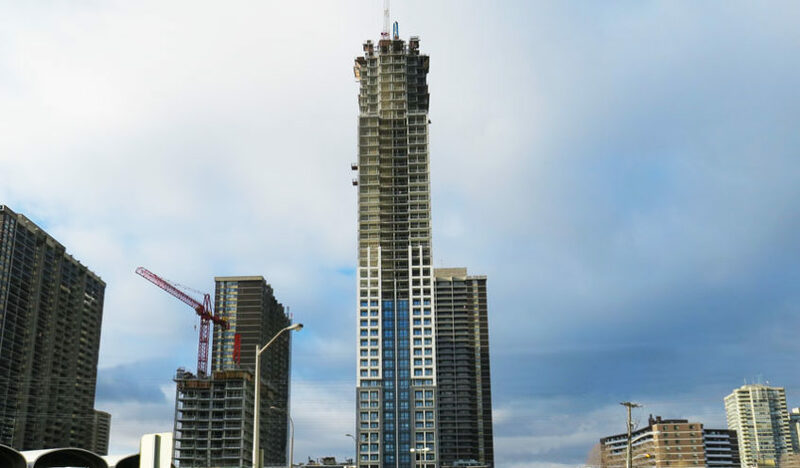 Islington Terrace, located near Bloor and Islington in Toronto’s west end, has now reached its full height of 45 storeys. If you have never watched the construction of a new community, here’s a simplified explanation of how its done: First, the structure is built one floor at a time, moving upwards. As the tower rises, trades are scheduled to begin work in a specific order, which is determined by a construction calendar. For example, once the tower has reached a certain height, window installation will begin on the ground floor and work “up” the building, floor by floor. Following shortly after the start of window installation, rough in of the exterior drywall, wall studs and corridor walls will begin work. As the drywall contractors complete a floor and move up to the next one, another trade will begin work below, with each trade literally “following” each other up the building. The process requires an incredible amount of coordination. At this stage of the project, the onsite construction team at Islington Terrace is coordinating both the exterior and interior work. 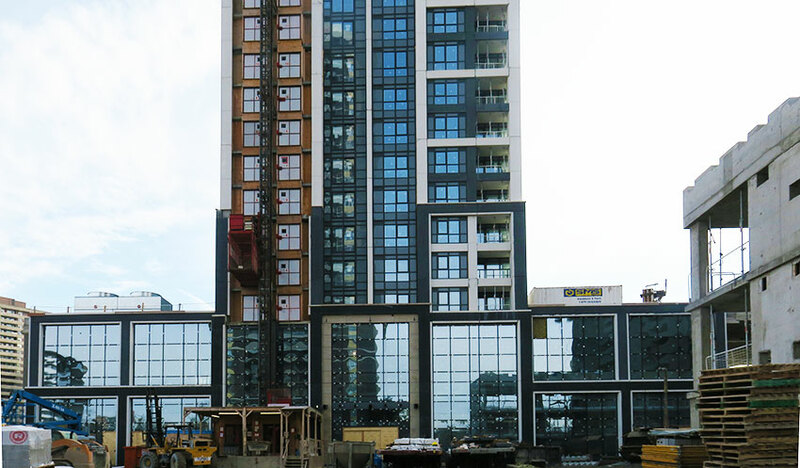 Outside, the striking, modern architectural design is starting to take shape as pre-cast work continues on the 22nd floor. The contrasting dark and light pattern of granite and limestone designed by award winning firm, Kirkor Architects, creates a bold and visually compelling addition to the city skyline. Inside, both electrical and mechanical (such as plumbing) rough-ins continue. Suite studs are complete to the 6th floor and windows have been installed up to the 17th floor. The first of three towers in this community, Islington Terrace will be home to 430 suites, an elegant two-story central lobby and approximately 26,000 sq. ft. of spectacular indoor and outdoor family friendly amenity space in the heart of Etobicoke’s City Centre. Find out more about Islington Terrace community online or visit our Presentation Centre at 3326 Bloor Street West.